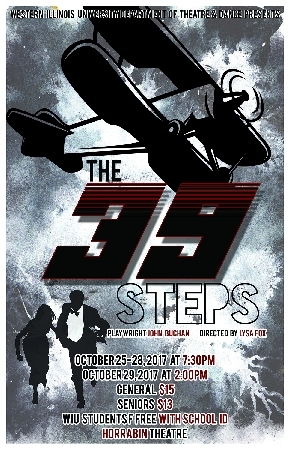 MACOMB, IL - The Western Illinois University Department of Theatre and Dance will present "The 39 Steps" in the Horrabin Hall Theatre at 7:30 p.m. Wednesday-Saturday, Oct. 25-28 and at 2 p.m. Sunday, Oct. 29. The play is directed by WIU Assistant Professor of Theatre Lysa Fox. 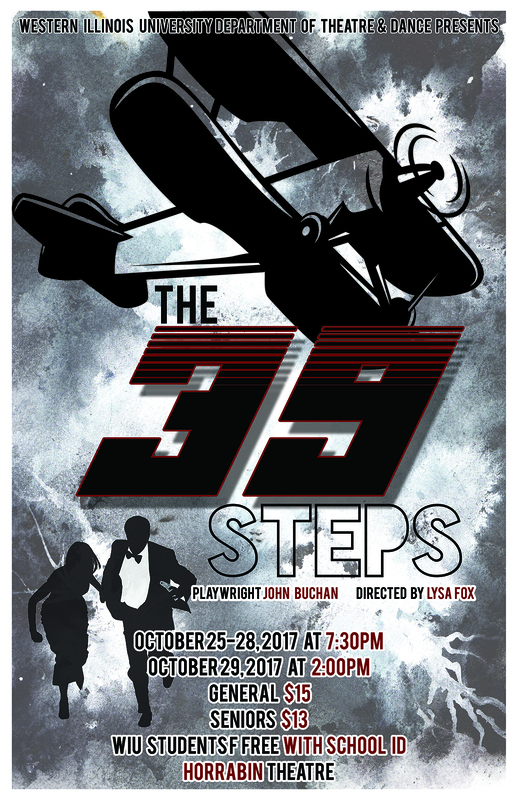 "'The 39 Steps' is comic farce based on the 1935 Alfred Hitchcock film of the same name," said Fox. "The stage version features just four actors, with three of them playing upwards of 30 characters total." The actors include James Tweedale, an MFA graduate student from North Bend, WA, as Hannay; Samantha Bonzi, a senior musical theatre major from Rockford, IL, as Annabelle/Margaret/Pamela; and Matt Bender, an MFA graduate student from Macomb, and Sean Pollock, a senior chemistry major from Dunlap, IL, as clowns. Tweedale plays the hero, while Bonzi plays the three women with whom he has romantic entanglements, and Bender and Pollock play every other character in the show: heroes, villains, men, women, children and more. "It's a fast paced comic romp sure to put a smile on your face," said Fox. "If you're a Hitchcock or film noir fan, there are lots of little treasures tucked into this contemporary adaptation." Fox is the head of Western's musical theatre program and her experience includes musical theatre, vocalist, and cabaret performer, as well as director, choreographer, actress and improvisational performer. The play is open to the public, and tickets are available through the Hainline Theatre Box Office, at BCAbringstheStars.com or by calling (309) 298-2900. Public tickets are $15 each, while tickets for senior citizens, WIU employees and youth are $13 each. WIU Students are admitted free with their student identification card. Special pricing is available for Dads' Day guests. For more information, call (309) 298-1543.